Back in 1976, Jack Kirby, comics genius and co-creator of the Fantastic Four and Captain America (to name just a few), began a new series at Marvel titled "The Eternals." 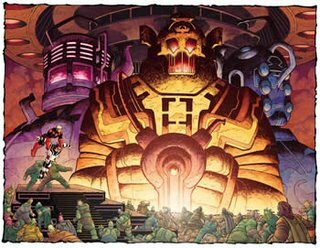 Like a lot of Kirby's work during the '70s, it was heady, epic stuff involving an immortal offshoot of humanity, genetically enhanced by a race of mysterious, skyscraper-sized creatures known as The Celestials. Sadly, like a lot of Kirby's '70s work, it didn't last long. It was canceled after 19 issues. 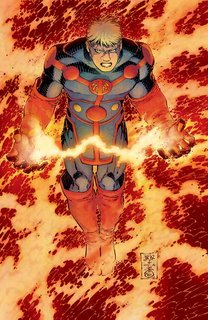 Now acclaimed author Neil Gaiman ("Sandman," "American Gods") and John Romita Jr. have taken up Kirby's baton and run off in their own direction with "The Eternals," a six-issue limited series that pays homage to Kirby's vision while modernizing the concept. As an added bonus, Marvel has also collected Kirby's original "Eternals" series into a hardcover, $75 volume. The first issue sees the godlike Eternals living quiet lives amid the rest of humanity, apparently suffering from amnesia about their true identities. Only Ike Harris (or Ikaris if you prefer) remembers anything about their past, and he spends much of that first issue trying to convince the skeptical Mark Curry ("Makkari") that he's not a student doctor but a super-powered immortal. Gaiman's dialogue is as clever and nuanced as ever, but the plot is as old as cliches get. Gaiman doesn't really do anything noteworthy with the premise, at least not yet (admittedly, it's still early). Still, if the story has trouble shifting into first gear, Romita's art is nothing short of marvelous. Romita has justifiably garnered a name for himself with his work on books such as "Spider-Man" and "Daredevil," but here, along with inker Danny Miki and colorist Matt Hollingsworth, he pulls out all the stops. His impossibly broad-shouldered characters combined with his feather-light lines help ground the comic, even in its more fantastic moments. Part of that excellence might be because he likes working with Gaiman. "Neil is amazingly eloquent and writes such quality dialogue. I enjoy just reading his scripts," he said during a phone interview. Romita, son of famed "Spider-Man" artist John Romita Sr., said that Gaiman's scripts allow for a lot of back and forth between the two. Perhaps the most impressive thing about Romita's work here is how he's able to echo Kirby without coming across as an imitation -- something several other cartoonists have attempted and failed. "There's enough Kirby in the book to flatter him but not enough to say we stole the whole nuance," he said. "I can't copy his style. I couldn't intentionally take Kirby's stuff and re-create it. It's so embedded in my subconscious, it's easy to evoke it." Vellekoop indulges in his love for musical drama in the handsomecoffee-table parody, featuring phony biographies of "notable" operastars. Vellekoop is a masterful cartoonist, and the book looks lovely, but it feels slight, which is surprising considering the book's size and packaging. Really, it just made me want to see him try his hand at something more challenging, like, say, a book devoted to real opera history. South African cartoonist Daly's work pays serious homage to the underground comics of the 1960s and '70s, both in its surreal narratives (the silent, enigmatic "Prebaby") or in the oddball humor ("My Beach Community"). Daly is no mere slave to the past, however. His work has a delightful, twisted energy that's all it's own. It's something I'd like to see more of. Hey, it's more Game Bytes!